Villa Sonia is amazing place to rest! We will definitely come back again! This location was incredible and we thought the value for money was exceptional. Staff were really friendly and helpful and provided local tips which were excellent. Highly recommend. Excellent location right on the beach. Bedroom had a gorgeous sea view. Staff very helpful. 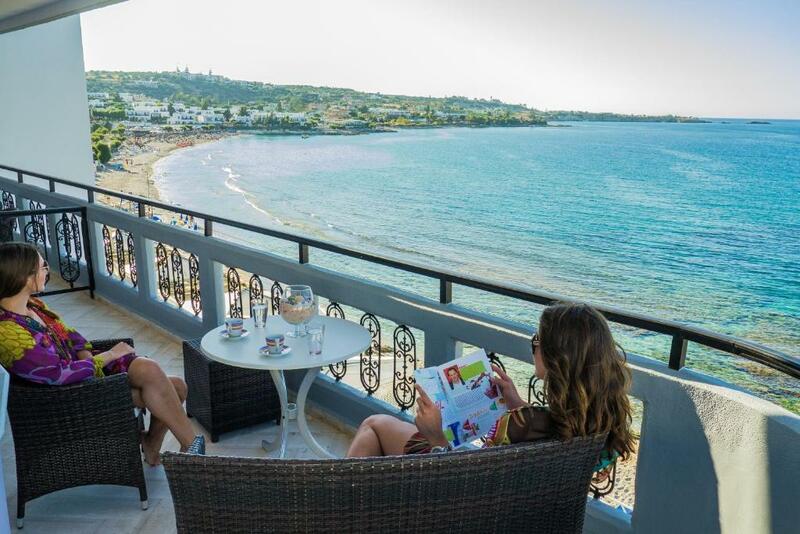 Note: Villa Sonia is away from all the hustle and bustle of Hersonissos yet if you are in the mood for some nightlife, it's just a short walk around the corner along the bay. This makes it perfect! Beach right across the road and many good restaurants. I'm so glad I booked Villa Sonia, it was everything I wanted! Highly recommended. 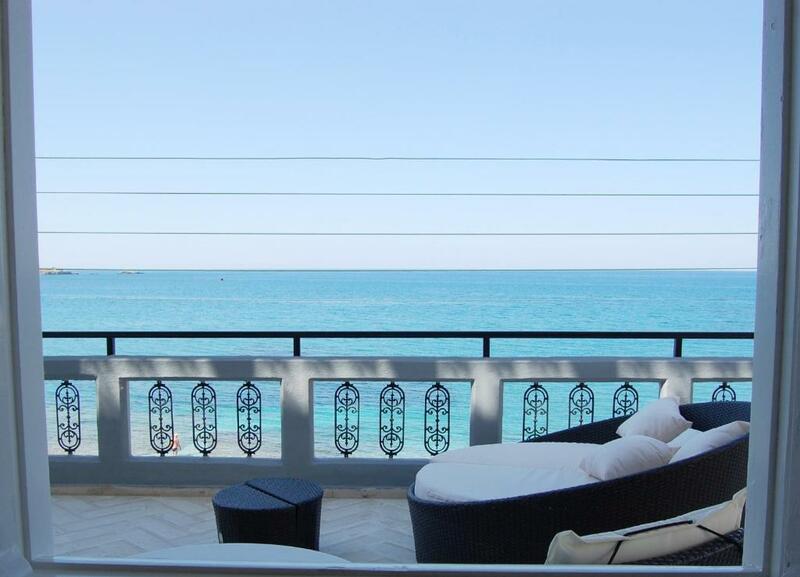 The balcony overlooking the beach. Great spot and thankful for the kitchen facilities and updated interior. If you're looking for jewelry, the shop just below gives a good discount for guests. I loved everything, stunning ,modern, clean, absolutely beautiful ! 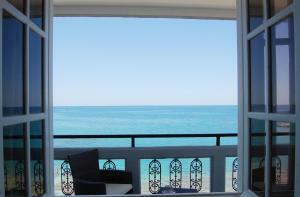 Fabulous location, our apartment (102) had a huge terrace directly overlooking the beach/sea. One minute round the corner was the harbour with many shops and restaurants/bars. Spotlessly clean and all you need in the kitchen. Dogs are allowed - purpose of our visit was to adopt a shelter dog, so perfect for us. Great value for money. If we have a reason to return here, would definitely stay at Villa Sonia again. Fabulous Sea view from our apartment, lovely people, 2 mins walk from beach and the best restaurants around the harbour area, perfect, just perfect ! We will be back many many times and we will recommend ! I must highly recommend this place, especialy lovely owner. The lady is trying to do all the best for their guests. We came earlier and room was ready even at two hours earlier than should-at 12.00 o clock. Room is beautifull, all in greak white/blue style and very comfy beds. What I want to highly recommend is the balcony, just right behind the sea. Excellent choice!! 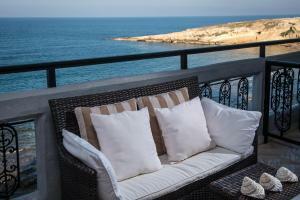 Lock in a great price for Villa Sonia – rated 9.2 by recent guests! One of our top picks in Hersonissos.Located right by the beach and just 650 feet from a conference center in the lively Hersonissos town, Villa Sonia provides fully equipped apartments and studios with free Wi-Fi. Whether you choose an elegant deluxe apartment or studio, you can enjoy comfort and tasteful décor at Villa Sonia. Most rooms have private balconies and some feature views of the Cretan Sea. The staff team is happy to help you arrange snorkeling and diving sessions at the nearby beach. There is a restaurant close by serving a variety of cuisine. A bus stop can be found within 1,150 feet from the property. 뀐 Located in the real heart of Hersonissos, this property has an excellent location score of 9.5! When would you like to stay at Villa Sonia? This studio offers a balcony with a side sea view. Bedding types upon request and availability. Featuring a balcony with sea view, this apartment has one double bedroom and a separate living room, with sofa beds or normal beds for extra occupancy. Bedding types are available upon request and subject to availability. 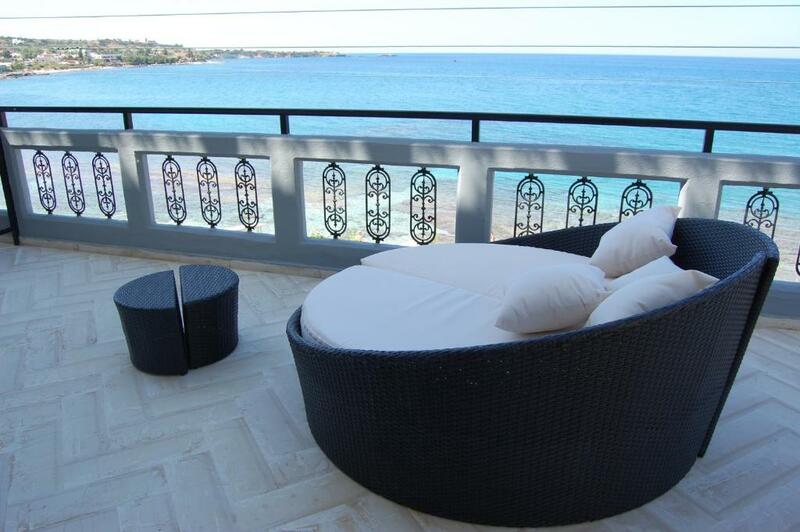 Offering a large balcony with a sea view, the apartment has a living room and a separate bedroom. The sofa and armchairs add to the comfort of the apartment. 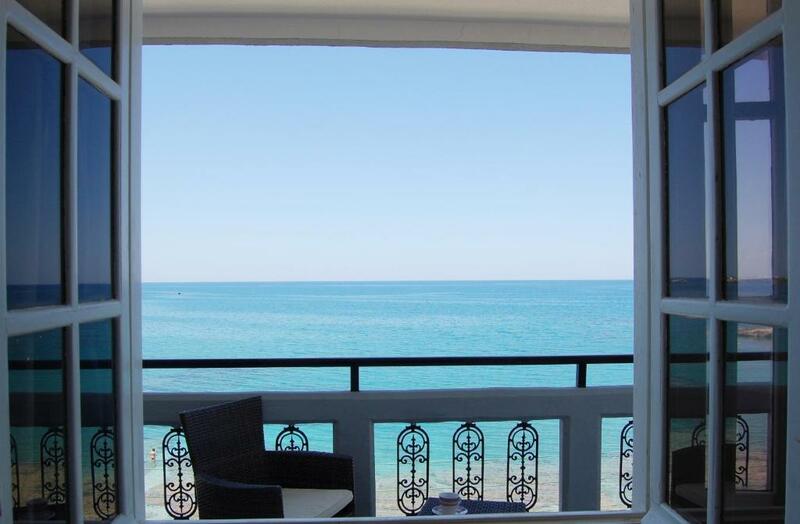 Overlooking the sea from its balcony, this apartment offers a bedroom and a separate living room. Bedding types upon request and availability. The rate is based on 3 guests. It can accommodate 1 extra guest (see Hotel Policies). This apartment features a tile/marble floor, kitchenette and kitchenware. Kindly note that there is no elevator access to this apartment, and that there is also a staircase inside the apartment. 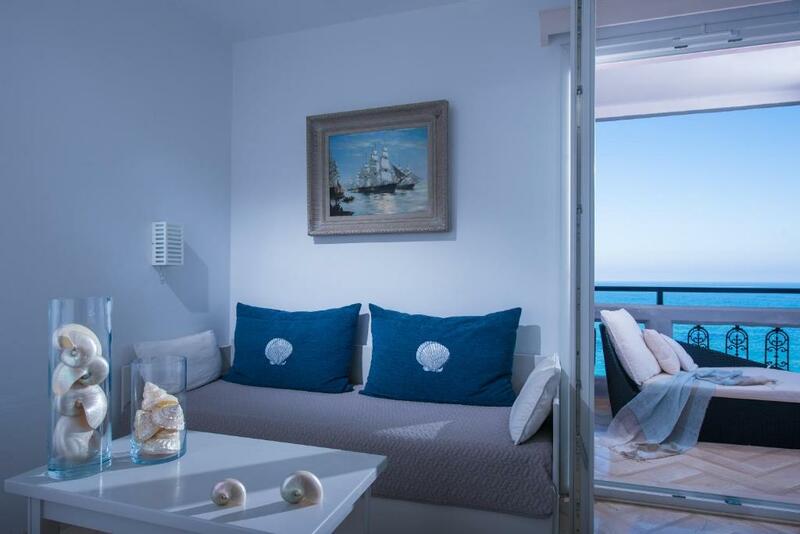 Offering a lateral sea-view from its large window, this studio has a balcony, electric kettle and dining area. Kindly note that there is no elevator access to this apartment, and that there is also a staircase inside the studio. Please note that the room and bed type will be allocated at check-in according to availability. Guests may be asked to change studios during the stay, and room types may vary. It is a small, family business, open from May to October. Villa Sonia was built by my parents and I was very proud to take it over in 2002. It is ideal for couples, families and travellers who want to relax in a discreet, serene environment. I took over my parents’ business by my need to make other people happy :) Vacation is very important to all of us and I am truly dedicated in making it unforgettable for my guests. I am very honoured that people trust me to be a part of their holiday memories. Fortunately our neighbourhood is quiet, given the fact that there are no bars near the site. 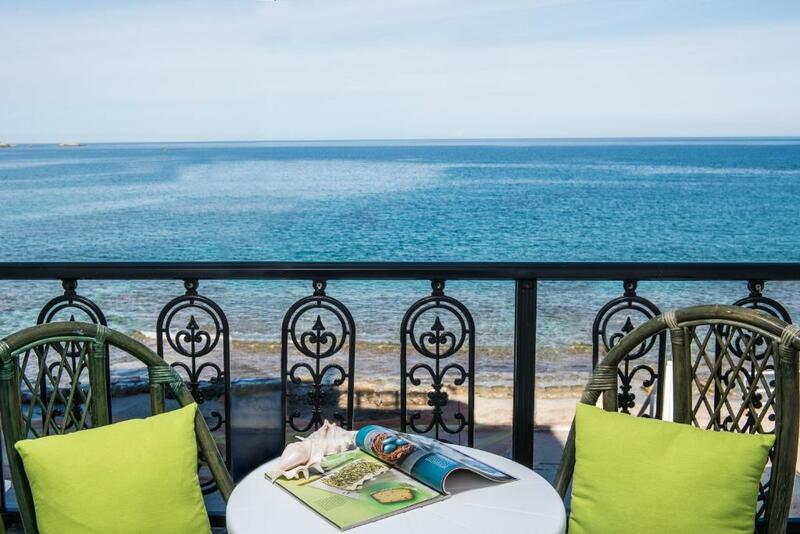 You can, nevertheless, live the night life of Hersonissos just around the corner (in only two-minute walking distance) or you can relax on your balcony and enjoy its spectacular sea view by the sound of the waves, instead. There are plenty of restaurants and cafes near the site, two mini markets and one super market. The local conference center is only 5 minutes walking distance. The sea in front of Villa Sonia is ideal for snorkelling, but if you prefer only sand it is only 1 minute away. The beach is organized and, in case you are thirsty or hungry, you can order anything you wish at the restaurant just above. House Rules Villa Sonia takes special requests – add in the next step! ATM card Villa Sonia accepts these cards and reserves the right to temporarily hold an amount prior to arrival. Villa Sonia accepts these cards and reserves the right to temporarily hold an amount prior to arrival. Transportation to and from the port can be arranged at an extra charge. Please note that breakfast is served daily after 9:30a.m. Room cleaning and towel changing occurs 3 times per week. Sheets are changed once a week. Kindly note that for group reservations of more than 3 rooms, different policies apply. The property will contact you after you book to provide further info. Kindly note that all double beds are 2 single beds joined together with a special mattress, leaving no gap between the beds. Not many TV channels in English it would be nice to have one or two British channel BBC one or ITV. Can't think of anything to dislike. The breakfest in the hotel next to this appartments. Horrible food, low offer. But again, owner solved everything! Great value for the money, friendly stuff and very clean rooms with fantastic view. Highly recommend. There is no thing I didn’t like, everything was perfect. The apartment was clean, it was very well located, near the port and in front of the beach. When we arrived the owner gave us a room with superior category, with a big balcony in front of the beach. I didn’t want to leave the apartment. The owner was very kind with us, in Fact as we stayed in villa Sonia we got a discount from a jewellery. The lady that helped us was very friendly. I asked for 2 seperate beds and we got that the day after, and the room was even an upgrade. She was really friendly en helpfull. The location is the best in Hersonissos, because it is just at the corner of the bar/mainstreet, but you dont hear the noise. So everything is on walking distance. Beautiful view from the large balcany of superior room 😍. Very friendly service and very clean. I highly recommend. Very good value for money! Staff friendly and easy to deal with given I only speak english. Location was fabulous. Accommodation in Villa Sonia was more than pleasant. The room was very spacious, well equipped, clean and the view from the window was incredibly beautiful. We spent a lot of time on the balcony. Thanks to its location near the sea, the room was very pleasant even without having to switch on air conditioning. The accommodation is a short walk from the center of Hersonisson, but the room was quiet. Despina was great! Thank you.